Dr. Bernd Wild is originally a graduate physicist. After completing his studies, he worked for several years at a computer science research center in the field of artificial intelligence and its possible applications in industrial processes. Upon obtaining his PhD, Dr. Wild was responsible for the organization and management of C/S software development at an IT service provider in the banking sector. 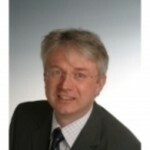 Together with some partners, he founded intarsys consulting GmbH in Karlsruhe in 1996. Dr. Wild now concentrates on consulting and providing assistance for complex system integration projects. Document technology has increasingly become a focal point during the past few years. This includes not only the creation of documents from source data, but also the entire documentation life cycle through to archiving. Technologies like electronic signatures, intelligent forms and document standards are at the core of his activities. In addition, intarsys offers products and software components that support these technologies and can be used for easily and reliably designing customer specific solutions.